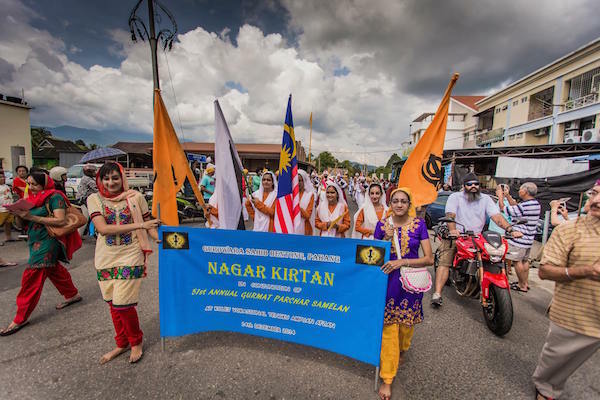 Some 800 participants and facilitators are converging for one-week at Bentong, a sleepy town in the Malaysian state of Pahang, for the Annual Gurmat Parchaar Samelan. The one-week Sikh youth camp, which began yesterday (Dec 14, 2014), is said to be one of the largest annual Sikh youth camp in the world. Organised by Sikh Naujawan Sabha Malaysia (SNSM), it has been running for 51 years, with the first camp held in 1963. It was officially opened by Malaysian Cabinet minister Liow Tiong Lai, who is the member of parliament for Bentong. Liow, who is also president of the Malaysian Chinese Association (MCA), one of the members of the ruling Barisan Nasional (BN) coalition, also pledged a RM20,000 for SNSM. He also urged Sikh students to considering pursuing their tertiary studies at Universiti Tunku Abdul Rahmar (UTAR), an institution of higher learning that was set-up by MCA. He said it provides interest-free loans to students of all races as part of its nation building efforts. Bentong was host to SNSM’s previous annual camps in 1980 and 2009. Liow, a Malaysian Cabinet minister, sitted within the sanggat before giving his speech at the opening of the SNSM’s Annual Gurmat Parchaar Samelan 2014. Gavin, you are right. Bentong is not a sleepy town, after all. We stand corrected. Its quite a lively town, a food haven. We understand that folks from Kuala Lumpur actually make their way to this town over weekends for food. The drive is only about an hour via the Karak Highway. We found out that, among others, Bentong is a draw for wild boar nasi lemak, apparently available at a restaurant just behind the gurdwara sahib. Bentong is also a gateway to Gua Musang, Kelantan. It was also an important pass through town for people making their way to Kuala Lipis, the state capital of Pahang from 1989-1953. Your grandfather sleepy town in the Malaysian state of Pahang. Arent u spending time in the samelan grounds,then how do u know that its a sleepy town. If thats so you can take your Samelan and make somewhere more happening!!! !